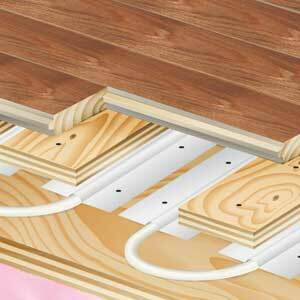 If you are having new floors installed it is a perfect time to consider also installing a radiant floor heating system. Allow us to meet with you for a free consultation to discuss what you would like and how we can deliver your needs for the right price. Gemini offers both flooring and HVAC Services. Our flooring and HVAC specialists will handle every aspect of your installation. Here is what you need to know about floor heating systems. There are basically two types – electric and hydronic. Electric systems use cables beneath the floor to generate heat. These systems are usually designated to certain rooms because they are less efficient cost wise. Hydronic systems are the most common & cost effective. They are very efficient for heating an entire house. A water boiler heats water which is pumped through a pattern of tubes beneath the finished floor. Heat reflecting insulation or heat transfer panels directs heat upwards through the floor and the heat rises, evenly heating the rooms. Hydronic systems are more efficient than any other heating system whether it be gas or electric forced air or above floor radiators. Water boilers operate more efficiently & less energy is consumed because relatively low heat is required to heat the water. The transfer of heat from the floor distributes heat evenly throughout the room and without fluctuations in temperature, unlike other heating systems. In other systems heat rises up becoming lost to surrounding surfaces, and comes back down as cool air. Most of the heat remains above head level and diminishes downwards to where floor level can remain cold. 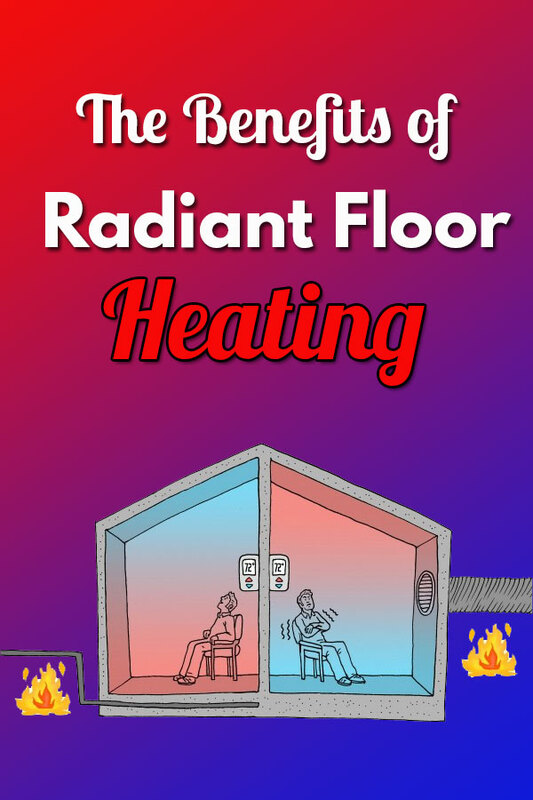 With a radiant floor heating system the whole floor is a radiator. The constant & even heat increases comfort always keeping the floor & living space warm. 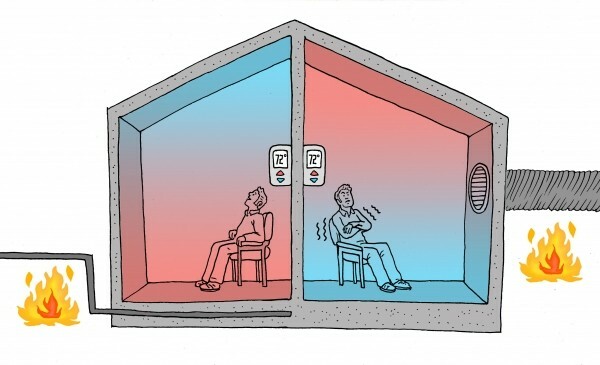 Some systems can also allow regulation of individual room temperatures, each room having it’s own thermostat. With a radiant floor system room temperarures can be raised within minutes. Generally room temperatures can also remain lower because the radiant heat provides more comfort as it provides you heat starting from your feet up. All of this means energy savings and lower energy costs of 30-50%. A radiant floor heating system also provides better air quality as it does not circulate dust & allergens like forced air. Nor does it create dry air also effecting nasal conditions. And these systems are completely silent – no hissing, pinging or blowing sounds. Most types of flooring materials will work with a heating system. Ceramic or stone tile happens to have the highest ability to transfer heat. Wood floor installations are most common. 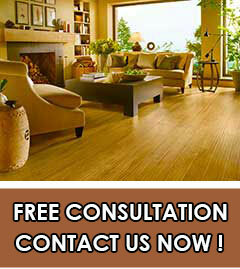 We install many hardwood floors with heating systems. In homes with high humidity laminate wood or engineered wood is sometimes recommended because it’s structure is more resistent to longterm possibility of warping or cracking caused between repeated moisture & drying. Other materials like vinyl or carpet may also be used though carpet must be very thin so that it does not overinsulate the floor. Generally the upfront costs of installing a radiant floor system may be higher than other types of heating systems like forced air or above floor radiators. However the system will be adding comfort and efficiency which will lower energy costs in the long term. If you’re already planning to install a new floor it is the perfect time to consider installing a radiant floor system as well. Any water heater which is not too old will work sufficiently. For maximum efficiency a newer high efficiency, gas modulating & condensing water boiler is recommended.